The Visionary Experience of Hungarian Shaman Joska Soos de Sovar. Joska Soos was a most remarkable shaman. I have never met anyone else who was always in his center, in clear awareness. He was initiated into sound, the highest initiation among shamans. He sang constantly, with guttural sounds. He spoke Hungarian, French and Dutch, having moved to Belgium. His most remarkable achievement is as an artist. 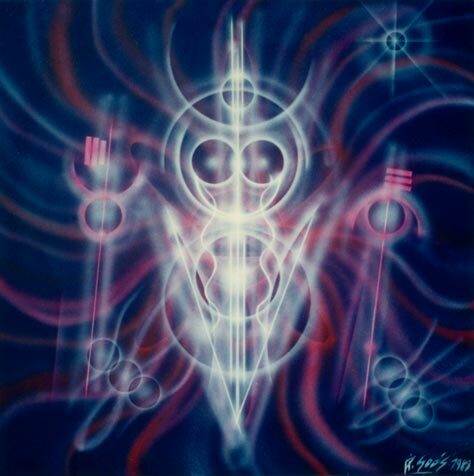 In his art he revealed the long held secret among shamans: the existence of beings who consists of light and sound. He was the only shaman in the world to bring this out into the world. It is important that his message lives on, and that his paintings are accessible to all. When I started this website in 2001, he gave me written permission to use all his works to display on these pages. 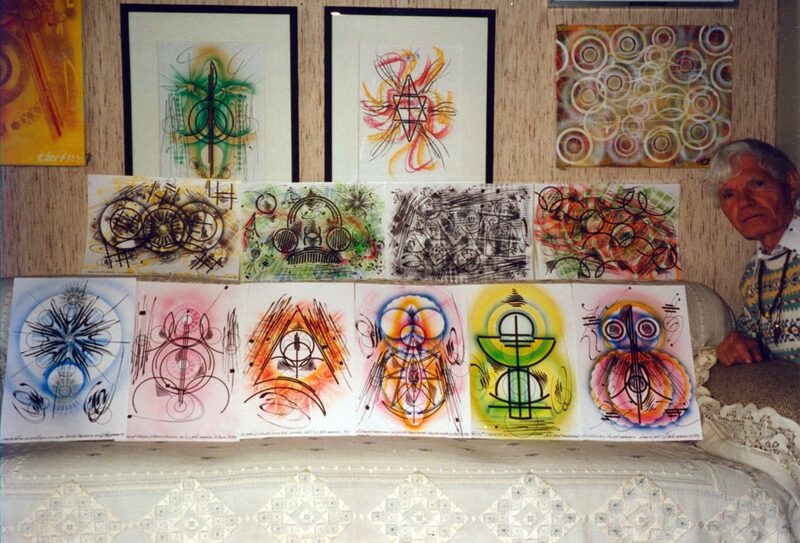 Over the years he sent me many original drawings of light beings, and pictures of himself and his paintings. 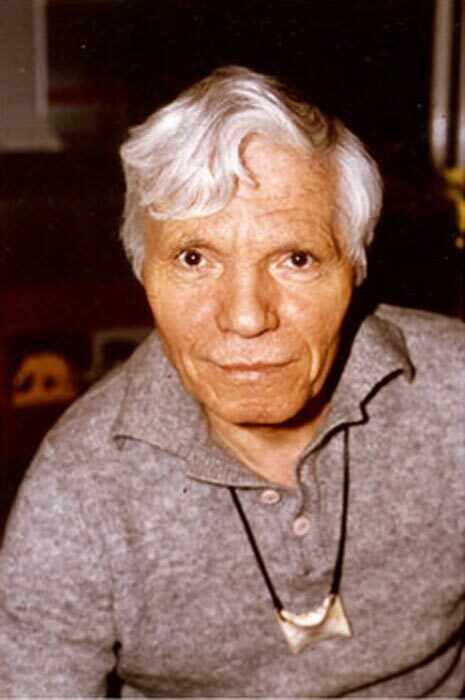 Take your time to look at his paintings and drawings, and connect with the light-sound beings, and the existence of life at this level of consciousness. 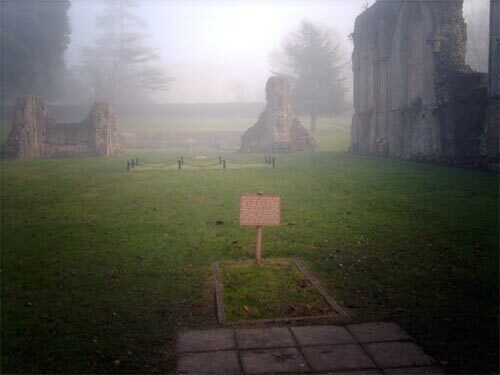 he grave of the legendary King Arthur at the ruins of the Abbey at Glastonbury, England. In the summer of 1989 I went on a truly mystical tour of southern England. At the legendary grave of King Arthur in Glastonbury a young man sat in front of the grave making beautiful sounds with two shining metal bowls. A member of my group explained that these were singing bowls. She advised me to visit Joska Soos, a Hungarian shaman in Antwerp (Belgium) who used singing bowls in his life work as a healer, and who also gave private sessions he called “shamanizations”. Since I have always been a spiritual seeker, I decided to explore a shamanization first-hand. On the 6th of November my life was to be steered in a new direction. The sun was bright when I arrived at the home of Joska Soos. One in a long row of houses, his stood out from all the others with a front garden full of tall and bountiful plants, through which a small path led to the door. Ringing the bell I looked through the glass into a hallway with many strange paintings. Down the stairs he came, singing in a low voice. Opening the door he cordially invited me in. The paintings immediately captured my attention. Resembling abstract art, they had another dimension. Radiating and alive, they communicated on a level I had never experienced. Joska explained that beside being a shaman he was also a painter. 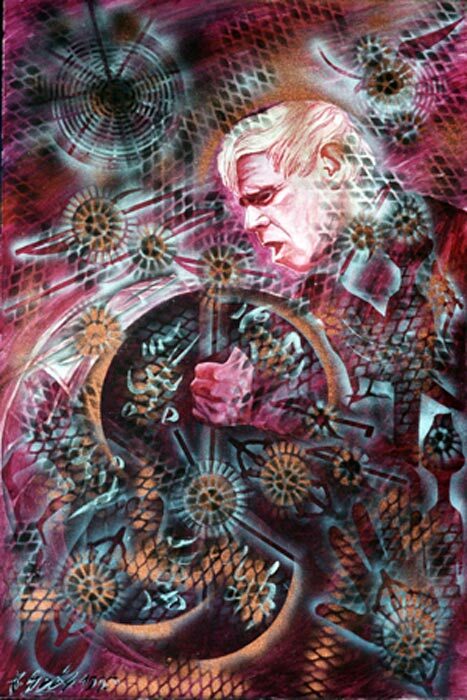 Most of his paintings are of light-sound beings from other dimensions which he perceives with his inner eye. Later on he would tell how these beings, composed entirely of light and sound, are found throughout the cosmos. 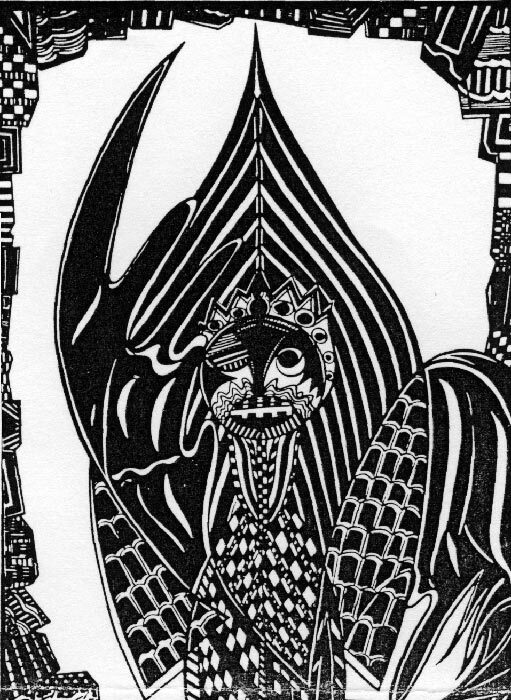 It had been a closely guarded secret among shamans that these beings exist, and it has always been strictly forbidden to talk about them, but because he believed this knowledge will benefit all people. Joska Soos painted these mysterious, powerful beings, in spite of some angry fellow shamans. When we were standing the hallway, I was looking at all the paintings on the walls. 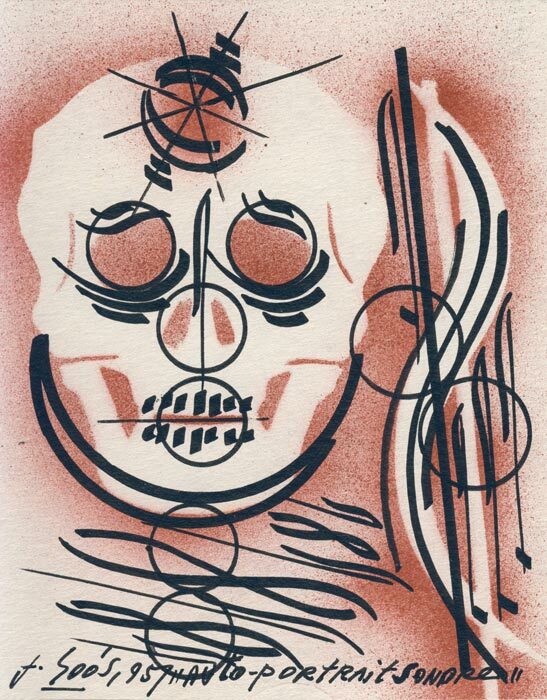 I was particularly struck by a painting which was based on the drawing below. I explained him that I felt a very positive energy coming from the being and I asked him what it represented. To my surprise he answered that it was Dracula. Joska was delighted at my reaction, and he explained that Dracula was and still is a beneficial earth spirit in Hungary. Unfortunately, misunderstanding and the movie industry has made it into a horror story. The real Dracula spirit has nothing to due with this human fabrication. On the second floor we passed through a living room, filled with Buddhist paraphernalia. Going on to the third floor we came to the tiny room where his shamanizations take place. Joska Soos is a sound initiated shaman. In shamanic circles this is the highest degree of initiation. Knowledge of sound is one of the greatest of the mysteries of life and creation. As we are told in myths and esoteric teachings, the world is constantly being created and maintained by sound. New Age philosophies and healing practices that utilize the effects of vibration and sound are actually based upon older philosophies and spiritual doctrines. 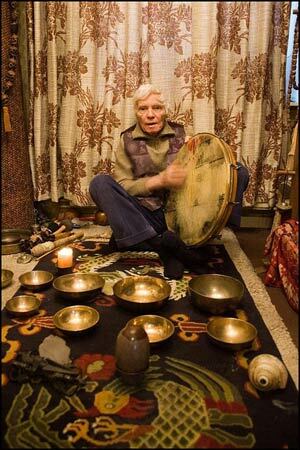 Joska Soos sat down behind a group of seven metal bowls and played them during the session together with his drum, a set of small, high-pitched Tibetan cymbals, and constant guttural singing. Afterwards I inquired about the metal bowls which, to my surprise, had produced such wonderful sounds. He explained that these “singing bowls” originally were made in Tibet by Buddhist monks. When I asked where I could buy such bowls, he offered those in front of him for sale. “Take what you want” he said. I could not believe that I could actually buy his bowls. “I have more in the back, I will replace them.” Two nicely polished bowls of medium size had really caught my attention, so the choice was not difficult. I have never regretted buying them, they remain the best I have. In the following years I bought several more from him, all of superior quality compared to any others I have seen anywhere else. The painting I was attracted to and bought from him on my first visit. Many months later, on a workshop, he casually mentioned that his wife had told him never to sell that painting. Joska, however, was unattached to things, or to what people told him. He lived and acted from his divine center. After the shamanization, which I had come for, I was again drawn to his paintings in the hall. He saw that I was intrigued and showed me even more paintings he had tucked away in his garage. On one of the paintings I experienced the light-sound being as being just in front of the canvas. It was really strange, I did not experience this with the other paintings. I really liked this light-sound being, and so I bought the painting, and a second one of the Alpha and Omega. I also left with two singing bowls. 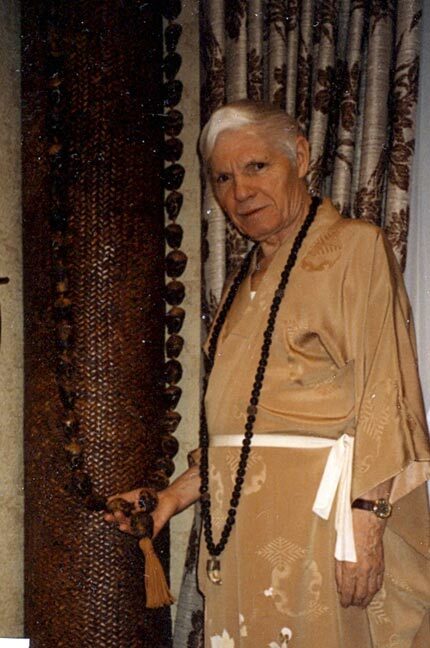 I was once offered to buy this giant mala he is holding here in his hand. He told me that all the beads are made of bones from the skeletons of Tibetan lamas (yes that is from Buddhist monks of higher rank and spiritual development). The beads are really big and carved in the shape of skulls. This mala is supposed to have strong spiritual energies. After I moved to the USA from Belgium (Joska was living in Antwerp), I kept corresponding with him by mail. Each time he sent a letter he would include pictures of himself, his paintings, but also small, original drawings of light-sound beings. A small painting, he sent to me in 1995, of his self portrait viewed with his inner eye on the level of sound consciousness. Every year Joska went on vacation at De Panne at the Belgian Coast. Visionary experience continued over there too, as did his artistic expression. Art is not limited to the canvas. 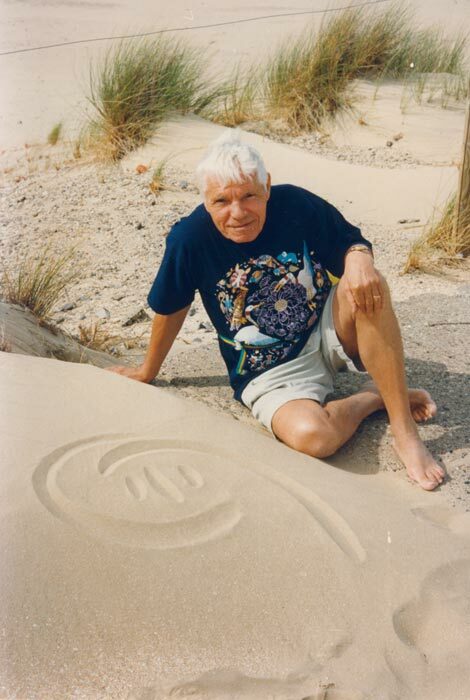 While on vacation at De Panne in1993, he sent me this picture. Art is not limited to the canvas. While on vacation at De Panne, at the Belgian Coast (1993), he sent me this picture.